Bred as a guard dog, the athletic, powerful Doberman pinscher intimidates some people. His determination and fearlessness can make him a handful, but keen intelligence and a sensitive nature make him highly trainable. If you guide him with firm, gentle leadership, he will follow your wishes like a faithful friend. Establish yourself as leader of the pack with consistent dominant behavior. Don't let your pup control your living space by blocking doorways, jumping on furniture or getting in the way during dinner preparation. Dobermans instinctively fill any power vacuum, so make it clear you are the alpha. Teach the basic sit command. Clip a leash to his collar and take up the slack on the leash with one hand. Grasp a small treat in your other hand. Hold the treat close enough to his nose that he can smell it, but don't allow him to eat it. Draw the treat slightly above his nose and then along the top of his head. He should follow the treat with his nose until his chin is up. Continue moving the treat back until his haunches fold into a sit. Repeat this exercise several times daily until he follows your hand without a treat. Insist that your Dobie sit before he eats, receives a treat, starts a game or goes outside. Keep your Doberman busy. Dobermans were bred as working dogs, so they need purpose. Without a productive focus for their energy, they tend to bark, dig and find mischief. Supply your Doberman with a variety of tough chew toys for gnawing. Hide treats or toys around the room or out in the yard and send him on a hunt to find them. Give your Doberman plenty of positive attention. This breed's fierce loyalty needs reciprocation. Dobermans who are left alone for long periods are more likely to exhibit compulsive behaviors such as flank sucking and excessive licking. Set aside a period each day for play. Provide plenty of exercise, and if possible a large fenced yard for your pup to run in. 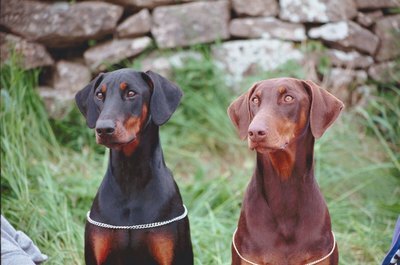 An energetic nature is part of the breed standard, and your Doberman needs at least 30 minutes of activity twice a day, according to the Doberman Pinscher Club of America. The more exercise he gets, the calmer and more trainable he will be. Avoid tug-of-war, chasing games or other competitive activities that might encourage aggressive behavior in your Doberman. Fetch, flying disk and other tossing games provide cooperative opportunities more suitable for the breed. Set up a large crate in an area where your pup will have plenty of company. Throw a small treat into the crate and encourage him to follow the treat inside. Stay with him and talk to him while he is inside, occasionally feeding him another treat. Repeat this exercise daily until he begins to go into the crate on his own and use it as a resting place and den. Do not use the crate to isolate or punish your Doberman; rather, it should be his safe place where he can have quiet time. Correct your Doberman's behavior with consistency, patience and love. Reward good behavior with treats and kind words. Your Doberman's powerful jaws can shred rope toys and splinter nylon chew bones. When you give him toys, observe him carefully to make sure he doesn't swallow pieces of them. Is the Mini Pinscher Related to the Doberman?